Catherine Leimkuhler Grimes, assistant professor of chemistry and biochemistry, has been awarded a University of Delaware Research Foundation grant to investigate if it is possible to bioengineer bacteria that will help scientists better understand the onset of chronic inflammatory disorders such as Inflammatory Bowel Disease. 11:36 a.m., June 12, 2012--The University of Delaware Research Foundation (UDRF), a private corporation chartered in 1955 to support UD research, has funded 11 new projects in science and engineering on the UD campus. Each project is supported by a $35,000 grant  a combination of $25,000 from UDRF and $5,000 each from the provost and the researcher’s dean. The grants seed original, high-priority, “proof of concept” studies that are designed to lay the groundwork for future proposals to external agencies such as the National Institutes of Health, the National Science Foundation and others. Cristina Archer, associate professor of physical ocean science and engineering, will develop a numerical model to simulate how wind turbines extract kinetic energy from wind and convert it to electricity (through rotating blades) and to turbulent kinetic energy (through small eddies produced in the rotor’s wake). The computational fluid dynamics study will increase understanding of the atmosphere’s response to large-scale extraction of wind power and contribute to analyses of wind farm effects. One of the largest animal migrations on the planet occurs each day as organisms move from shallow waters at night into deep dark waters during the day to hide from predators, says Jonathan Cohen, assistant professor of marine biosciences. But it’s not a behavior governed only by light; it’s also activated by smell. In a study of mud crab larvae, Cohen will use electrophysiological techniques to explore how chemical and visual information gets integrated to sense the presence of predators. Chronic inflammatory disorders, such as Inflammatory Bowel Disease, arise from an inappropriate immune response to bacteria. Fragments of bacterial cell wall known as peptidoglycan can activate an immune response in humans, but scientists do not know how the immunostimulatory molecules in the cell wall operate. 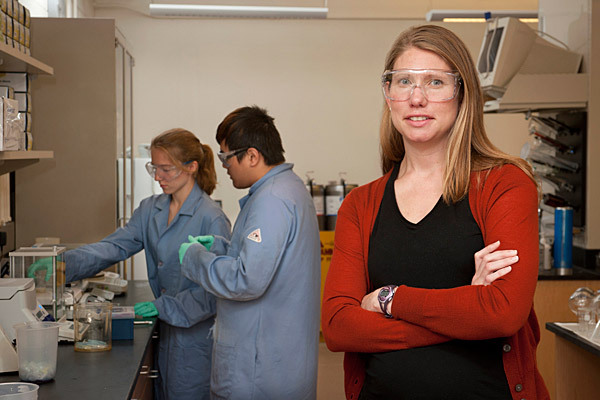 Catherine Leimkuhler Grimes, assistant professor of chemistry and biochemistry, will investigate if it is possible to bioengineer bacteria to better understand the initial recognition process. The Chesapeake Bay suffers from varying degrees of eutrophication, a reduction in water quality due to excessive nutrients. Deb Jaisi, assistant professor of plant and soil sciences, will analyze a key nutrient, phosphorus, in bay sediment cores and water samples to determine the changes of terrestrial phosphorus phases over time and their relationship to hypoxia, or oxygen depletion. Oxygen isotopes in phosphate will help identify the sources and biogeochemical cycling of phosphorus in sediment and the water column, yielding data useful to nutrient management programs. April Kloxin, assistant professor of chemical and biomolecular engineering, and materials science and engineering, will develop hydrogels for controlled release of therapeutic drugs to treat skin cancers. The hydrogels will be designed to degrade in response to cell-secreted enzymes and light from periodic irradiation, resulting in reduced toxicity and improved outcomes. Currently, non-surgical treatment of basal cell carcinoma, a prevalent skin cancer, requires daily topical chemotherapeutic application or weeks of photodynamic therapy, with only a 33 percent nodular cure rate. Christopher Kloxin, assistant research professor of materials science and engineering, will devise synthetic DNA arrays to detect single nucleotide polymorphisms (SNPs), subtle changes in the DNA that are believed to be responsible for many genetic diseases. The work exploits highly efficient and easily implemented chemical reactions, known as “click” reactions, to rapidly fabricate these arrays. This synthetic DNA platform combines enhanced sensitivity to detect SNPs and orders-of-magnitude fabrication cost savings to create a new diagnostic tool for the human health industry. Salil Lachke, assistant professor of biological sciences, will investigate the function of RNA binding proteins (RBPs) in eye development and their significance to human disease. Using a systems biology approach and a novel bioinformatics tool he developed, termed iSyTE (integrated Systems Tool for Eye gene discovery), he recently identified a new gene, TDRD7, the functional deficiency of which causes cataracts and glaucoma in mice and humans. His research will yield new information on the biological switches that control gene expression in eye development. X. Lucas Lu, assistant professor of mechanical engineering, aims to develop a non-invasive mechanical technique for the early detection of osteoarthritis, the most common joint disorder. Lu will use proteoglycan, the second most abundant component in cartilage, as a biomarker for arthritis diagnosis. The ultimate goal is to develop an arthroscope that can provide a precise quantitative evaluation of cartilage in clinical practice. Super resolution fluorescence microscopy enables optical imaging of subcellular structures with a resolution approaching 10 nanometers. Super resolution imaging of live cells is poised to transform cell biology, but is challenged by the practical demands of the method. Edward Lyman, assistant professor of physics and physical chemistry, aims to overcome these limitations by a combination of modeling and advanced signal processing techniques. In Delaware, concrete damaged by alkali-silica reaction (ASR) is widespread in roadways, identified by visible cracks. Julia Maresca, assistant professor of civil and environmental engineering, will identify microbes associated with ASR-susceptible concrete and evaluate their use as “biomarkers” that signal ASR-like conditions before large cracks develop, leading to earlier interventions rather than repair of damage. Future work would involve cultivating bacterial strains capable of precipitating minerals to fill in cracks. Diversity in the health care workforce is critical to dissipating health care disparities, yet there is an alarming lack of African American representation among practicing physicians. In this multi-institution study, Barret Michalec, assistant professor of sociology, will follow African American pre-med students for two years (through surveys and interviews) to learn how they experience particular obstacles and if and how these issues may push them off the pre-med track and prevent them from entering medical training.